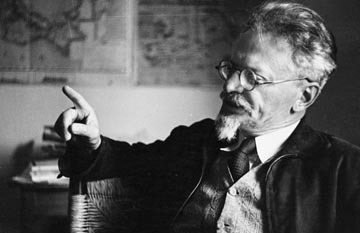 Trotsky hailed the great master on his 80th birthday. "Tolstoy has passed his eightieth birthday and now stands before us like an enormous jagged cliff, moss-covered and from a different historical World". Tolstoy has passed his eightieth birthday and now stands before us like an enormous jagged cliff, moss-covered and from a different historical World. A remarkable thing! Not alone Karl Marx but, to cite a name from a field closer to Tolstoy’s, Heinrich Heine as well appear to be contemporaries of ours. But from our great contemporary of Yasnaya Polyana we are already separated by the irreversible flow of time which differentiates all things. This man was 33 years old when serfdom was abolished in Russia. As the descendant of “ten generations untouched by labor,” he matured and was shaped in an atmosphere of the old nobility; among inherited acres, in a spacious manorial home and in the shade of linden-tree alleys, so tranquil and patrician. The traditions of landlord rule, its romanticism, its poetry, its whole style of living were irresistibly imbibed by Tolstoy and became an organic part of his spiritual makeup. From the first years of his consciousness he was, as he remains to this very day, an aristocrat, in the deepest and most secret recesses of his creativeness; and this, despite all his subsequent spiritual crises. In the ancestral home of the Princes Volkonsky, inherited by the Tolstoy family, the author of War and Peace, occupies a simple, plainly furnished room in which there hangs a hand-saw, stands a scythe and lies an ax. But on the upper floor of this same dwelling, like stony guardians of its traditions the illustrious ancestors of a whole number of generations keep watch from the walls. In this there is a symbol. We find both of these floors also in the heart of the master of the house, only inverted in order. If on the summits of consciousness a nest has been spun for itself by the philosophy of the simple life and of self-submergence in the people, then from below, whence up the emotions, the passions and the will, there look down upon us a long gallery of ancestors. In the wrath of repentance Tolstoy renounced the false and worldly-vain art of the ruling classes which glorifies their artificially cultivated tastes and envelops their caste prejudices in the flattery of false beauty. But what happened? In his latest major work, Resurrection, Tolstoy still places in the center of his artistic attention the one and the same wealthy and well-born Russian landlord, surrounding him just as solicitously with the golden cobweb of aristocratic connections, habits and remembrances as if outside this “worldly-vain” and “false” universe there were nothing of importance or of beauty. From the landlord’s manor there runs a short and narrow path straight to the hut of the peasant. Tolstoy, the poet, was accustomed to make this passage often and lovingly even before Tolstoy, the moralist, turned it into a road of salvation. Even after the abolition of serfdom, he continues to regard the peasant as his – an inalienable part of his material and spiritual inventory. From behind Tolstoy’s unquestionable “physical love for the genuine toiling people” about which he himself tells us, there looks down upon us, just as unquestionably, his collective aristocratic ancestor – only illumined by an artist’s genius. Landlord and moujik – these are in the last analysis the only people whom Tolstoy has wholly accepted into his creative sanctuary. But neither before nor after his spiritual crisis, was he ever able or strove to free himself from the purely patrician contempt for all those figures who stand between the landlord and the peasant, or those who occupy positions beyond the sacred poles of this ancient order – the German superintendent, the merchant, the French tutor, the physician, the “intellectual”, and finally, the factory worker with his watch and chain. Tolstoy never feels a need to understand these types, to peer into their souls, or question them about their faith. And they pass before his artist’s eye like so many insignificant and largely comical silhouettes. When he does create images of revolutionists of the Seventies or Eighties, as for example in Resurrection, he simply adapts his old landlord and peasant types to a new milieu or offers us purely external and humorously painted sketches. At the beginning of the Sixties when a flood of new European ideas and, what is more important, of new social relations swept over Russia, Tolstoy, as I said, had already left a third of a century behind him: psychologically he was already molded. Everywhere and in everything there came hurly-burly and turmoil, there came the decomposition of the old nobility, the disintegration of the peasantry, universal chaos, the rubbish and litter of demolition, the hum and ding-dong of city life, the tavern and cigarette in the village, the factory limerick in place of the folksong – and all this repelled Tolstoy, both as an aristocrat and as an artist. Psychologically he turned his back on this titanic process and forever refused it artistic recognition. He felt no inner urge to defend feudal slavery, but he did remain wholeheartedly on the side of these ties in which he saw wise simplicity and which he was able to unfold into artistically perfected forms. Such is the religious myth of Russian Populism which ruled for decades, over the minds of the Russian intellectuals. Stone deaf to its radical tendencies, Tolstoy always remained personally and represented in the Populist movement its aristocratic conservative wing. Tolstoy was repelled by the new and in order to create artistically Russian life as he knew, understood and loved it, he was compelled to withdraw into the past, back to the very beginnings of the 19th Century. War and Peace (written in 1867-69) is his best and unsurpassed work. The anonymous massivity of life and its sacred irresponsibility were incarnated by Tolstoy in his character Karatayev, a type least comprehensible to a European leader; at all events, furthest removed from him. It is that stage when the spirit, as Hegel put it, has not yet attained inner self-consciousness and therefore manifests itself only as spirit indwelling in nature. Despite his rather rare appearances Karatayev is the philosophical, if not the artistic axis, of War and Peace; and Kutuzov whom Tolstoy turns into a national hero is this very same Karatayev, only in the post of commafider-in-chief. In contrast to Napoleon, Kutuzov has no personal plans, no personal ambition. In his semi-conscious tactics, he is not guided by reason but by that which rises above reason – by a dim instinct for physical conditions and by the promptings of the people’s spirit. Czar Alexander, in his more lucid moments, as well as the least of Kutuzov’s soldiers all stand equally under the dominion of the land … In this moral unity is the pathos of Tolstoy’s book. How miserable, in reality, is this Old Russia with its nobility disinherited by history, without any elegant past of hierarchical estates, without the Crusades, without knightly love or tournaments of Knighthood, without even romantic highway robberies. How poverty-stricken so far as inner beauty is concerned; what a ruthless plunder of the peasant masses amid the general semi-animal existence! But what a miracle of reincarnation is a genius capable of! From the raw materiaI of this drab and colorless life he extracts its secret multi-colored beauty. With Homeric calm and with Homer’s love of children he endows everything and everybody with his attention. Kutuzov, the manorial household servants, the cavalry horse, the adolescent countess, the moujik, the Czar, a louse on a soldier, the freemason – he gives preference to none among them, deprives none of his due share. Step by step, stroke by stroke he creates a limitless panorama whose parts are all inseparably bound together by an internal bond. In his work Tolstoy is as unhurried as the life he pictures. It is a terrifying thing to say, but he rewrote his colossal book seven times … Perhaps what is most astounding in this titan creativeness is that the artist permits neither himself nor the reader to become attached to any individual character. He never puts his heroes on display, as does Turgenev whom Tolstoy disliked, amid bursts of firecrackers and the glare of magnesium flares. He does not seek out situations for them that would set them off to advantage; he hides nothing, suppresses nothing. The restless seeker of truth, Pierre Bezukhov, he shows us at the end as a smug head of a family and a happy landlord; Natasha Rostov; so touching in her semi-childlike sensitiveness, he turns, with godlike mercilessness, into a shallow breeding female, untidy diapers in hand. But from behind this seemingly indifferent inattentiveness to individual parts there rises a mighty apotheosis of the whole, where everything breathes the spirit of inner necessity and harmony. It might perhaps be correct to say that this creative effort is permeated with a pantheism for which there is neither beauty nor ugliness, neither the great nor the small, because it holds is the great and beautiful only the whole of life itself, in the perpetual circuit of its manifestations. This is an agricultural esthetic, merciless conservative by nature. And it is this that lends to the epics of Tolstoy kinship with the Pentateuch and the Iliad. Tolstoy’s two recent attempts to find some room for psychologic images and “beautiful types” to which he feels closest affinity within the framework of a more recent historical past – in the days of Peter the First and of the Decemberists of 1825 – have been shattered against the artist’s hostility to foreign influences with color both of these periods so sharply. But even where Tolstoy approaches most closely to our own times as in Anna Karenina (1873) he remains inwardly alien to the reigning hurly-burly and inflexibly stubborn in his artistic conservatism, scaling down the sweep of his own horizons and singling out of the whole of Russian life only the surviving oases of gentility, with the old ancestral home, ancestral portraits and luxurious linden alleys in whose shade, from one generation to the next, the cycle of birth: love and death changeless in its forms, is repeated. And Tolstoy delineates the spiritual life of his heroes in accord with the day-to-day life of their motherland: calmly, without haste and with vision unclouded. He never runs ahead of the inner play of emotions, thoughts or the dialogue. He is in no hurry to go anywhere nor is he ever late. His hands hold the strands tying together a host of lives, but he never loses his head. Like the master of an enormous enterprise who keeps an ever-wakeful eye on all its many parts, he mentally keeps an errorless balance sheet. All he does, seemingly, is to keep watch while nature itself carries out all the work, he casts a seed upon the soil and like a good husbandman calmly permits it to put out its stalk naturally, and grow full of ears. Why, this is the genial Karatayev with his silent worship of the laws of nature! He will never seek to touch a bud in order forcibly to unfold its petals; but permits them silently to open in the warmth of the sun. He is both alien and deeply hostile to the esthetic of the big-city culture which, in its self – devouring voracity, violates and torments nature, demanding from it only extracts and essences; and which with convulsively clutching fingers searches on the palette for colors non-existent in a sun-ray’s spectrum. In one of his novels Dostoyvsky – the city dweller without rank or title and the genius with an incurably pincered soul – this voluptuous poet of cruelty and commiseration, counterposes himself orofoundly and pointedly, as the artist, the new and “accidental Russian families,” to Count Tolstoy, the singer of the perfected forms of the landlord past. When the “beautiful type” disappeared, there came tumbling down not only the immediate object of artistic creativeness but also the foundations of Tolstoyan moral fatalism and his esthetic pantheism. The sanctified Karatayevism of the Tolstoyan soul was perishing. Everything that had been previously taken for granted as part of an unchallenged whole now became chipped into a sliver and by this token into a problem What was rational had become the irrational. And, as always happens, precisely at the moment when being had lost its old meaning, Tolstoy started asking himself about the meaning of being in general. In the life not of a youth but of a man 50 years of age there ensued a great spiritual crisis (toward the latter part of the Seventies). Tolstoy returns to God, accepts the teachings of Christ, rejects division of labor and along with it, culture and the state; he becomes the preacher of agricultural labor, of the simple life and of non-resistance to evil by force. The deeper was the internal crisis – and by his own admission the fifty-year old artist for a long time contemplated suicide – all the more surprising must it seem that Tolstoy returned, as the end result, to what is essentially his starting point. Agricultural labor – isn’t this, after all, the basis on which the epoepee [?] of War and Peace unfolds? The simple life, self-submergence in the elementary people – isn’t that where Kutuzov’s strength lies? Nonresistance to evil by force – isn’t the whole of Karatayev contained in fatalistic resignation? But if that is so, then of what does the crisis of Tolstoy consist? Of this, that what had previously been secret and subterranean breaks through the crust and passes over into the sphere of consciousness. Inasmuch as the spirituality indwelling in nature disappeared along with that “nature” which incarnated it, the spirit begins striving toward inner self-consciousness. That automatic harmony against which the automatism of life itself had risen must henceforth be preserved by the conscious power of the idea. In this conservative struggle for moral and esthetic self-preservation, the artist summons to his aid the philosopher-moralist. It would not be easy to determine which of these two Tolstoys – the poet, or the moralist – has won greater popularity in Europe: In any case, it is unquestionable that behind the condescending smirk of the bourgeois public at the genius innocence of the Yasnaya Polyana elder, there lurks a peculiar sort of moral satisfaction: a famous poet, a millionaire, one of “our own circle,” and an aristocrat to boot, wears out of moral conviction a peasant shirt, walks in bast-shoes, chops wood. It is as if here was a certain redemption of the sins of a whole class, of a whole culture. This does not, of course, prevent every bourgeois ninny from looking down his nose on Tolstoy and even lightly casting doubts about his complete sanity. A case in point is the not unknown Max Nordau, one of the brotherhood who take the philosophy of old and honest Samuel Smiles, spiced with cynicism, and dress it up in clown’s costume for columns on Sunday. With his reference text from Lombroso in hand, Nordau discovers in Tolstoy all the symptoms of degeneration. For all these petty shopkeepers insanity begins at the point where profit ceases. But whether his bourgeois devotees regard Tolstoy suspiciously, ironically or with favor, he remains for all of them a psychological enigma. Aside from a couple of his worthless disciples and, propagandists – one of them, Menshikov, is now playing the role of a Russian Hammerstein – one would have to say that for the last thirty years of his life, Tolstoy, the moralist, has stood completely alone. Aren’t our lives adorned and enriched, by division of labor? But division of labor maims the living human soul. Let division of labor rot! Art? But genuine art must unite all the people in the idea of God and not disunite them. Our art serves only the elite, it sunders people apart and :herefore it is a lie. Tolstoy courageously rejects as “false” the art of – Shakespeare, Goethe, himself, Wagner, Boecklin [Swiss landscape painter]. He divests himself of all material cares connected with business and enrichment and dons peasant clothing, as if performing a symbolic rite, renouncing culture. But what lurks behind this symbolic act? What does it oppose to the “lie,” that is, to the historic process. After doing some violence to himself, Tolstoy’s social philosophy may be summed up, on the basis of his writings, in the following “programmatic theses”: 1. It is not some kind of iron sociologic laws that produce the enslavement of peoples, but legal codes. 2. Modern slavery rests on three statutes: those on land, taxes and property. 3. Not alone the Russian state but every state is an institution for committing, by violence and with impunity the most horrible crimes. 4. Genuine social progress is attained only through the religious and moral self-perfection of individuals. 5. To get rid of states it is not necessary to fight against them with external means. All that is needed is not to take part in them and not to support them.” That is to say: 1. not to assume the calling of either soldier or field marshal, either minister or village head, either juryman or member of parliament; 2. not to pay taxes, direct or indirect, to the state voluntarily; 3. not to utilize state institutions nor government funds whether for salaries or pensions; and 4. not to safeguard one’s property by measures of state violence. As in his Populism, so, too, in his “anarchism,” Tolstoy represents conservative agricultural interests. Like the early freemasons who sought by ideological means to restore and strengthen in society the caste-guild morality of mutual aid which was falling apart naturally under the blows of economic development, Tolstoy seeks – to revive by dint of a religious-moral idea the life – under a purely natural economy. Along this road he becomes a conservative-anarchist, because what he requires, first and foremost, is that the state with its whips of militarism and its scorpions of the federal treasury let live in peace the all-saving Karatayev commune. Tolstoy has no inkling whatever of the globe-encompassing struggle between the two worlds – that of the bourgeoisie and that of socialism – on the outcome of which hinges the destiny of mankind. In his eyes socialism always remained a variety of liberalism, of little interest to him. In his eyes Karl Marx as well as Frederick Bastiat [a vulgar French economist, apologist for capitalism] were representatives of one and the same “false principle” of capitalist culture, of landless workers, of state coercion. In general, once mankind has ventured onto a false road, it really matters little how near or how far this road has been travelled. Salvation can come only by turning back. It is necessary to put an end to evil right now and for this it is enough to understand that evil is evil. All the moral feelings which have historically held the people together and all the moral-religious fictions arising from these ties are reduced by Tolstoy to the most abstract commandments of love, of temperance and of passive resistance. And since these commandments lack any historical content, and are therefore without any content whatever, they seem to him to be applicable at all times and to all peoples. To history Tolstoy grants no recognition; and this provides the basis for all his thinking. Upon this rests the freedom of his metaphysical negations as well as the practical impotence of all his preachings. The human life which he accepts – the former life of Ural-Cossack farmers in the, sparsely populated steppes of Samara province – took place outside of history; it constantly reproduced itself like the life of a beehive or ant-heap. What people call history is the product of senselessness, delusions and cruelties which deformed the true soul of humanity. Fearlessly consistent, Tolstoy throws property out of the window, along with history. Newspapers and magazines are abhorrent to him as documents of current history. With his breast he would beat back all the waves of the global ocean. His historical blindness renders him childishly helpless when it comes to the world of social problems. Tolstoy’s philosophy resembles Chinese painting, ideas of entirely different epochs are not located in perspective but arranged on one and the same plane. Against war he launches arguments of pure logic and to reinforce them adduces the opinions of Epictetus as well as those of Molinari (19th Century Belgian economist of the Manchester school); of Lao Tse (Chinese philosopher of the pre-Confucian era) as well as Friedrich II; of the prophet Isaiah as well as the columnist Hardouin, oracle of the Parisian grocers. In his eyes writers, philosophers and prophets represent not their own epochs but rather eternal moral categories. With him, Confucius strolls shoulder to shoulder with Harpagus (a minister of the Median King Astyages, 6th Century B.C. ); and Schopenhauer finds himself keeping company not alone with Jesus but also Moses. In his tragic single-combat against the dialectic of history to which he opposes his yes-yes or no-no, Tolstoy falls at every step into hopeless self-contradictions. And from this he draws a conclusion – wholly worthy of the stubbornness of this genius. “The incongruity between man’s position and man s moral activity,” he says, “is the surest sign of truth.” But this idealistic pride bears within it its own punishment. It would be hard to mention another writer whom history has used so cruelly as she has Tolstoy, against his own will. Moralist and mystic, foe of politics and revolution, he nourishes with his criticism the confused revolutionary consciousness of many Populist sects. Denier of all capitalist culture, he meets with benevolent acceptance by the European and American bourgeoisies, who find in his preachments a delineation of their own purposeless humanism along with a psychologic shield against the philosophy of the revolutionary overturn. Conservative anarchist, mortal enemy of liberalism, Tolstoy finds himself on his eightieth birthday a banner and a vehicle for the noisy and tendentious political manifestation of Russian liberalism. History has gained a victory over him, but failed to break him. Even now, in his declining years, he has preserved intact his priceless talent for moral indignation. In the heat of the vilest and most criminal counter-revolution on record [Trotsky here refers to the reign of terror in Russia after the defeated 1905 revolution] which seeks with its hempen web, of gallows to eclipse forever our country’s sun; amid the stifling atmosphere of degraded and cowardly official public opinion, this last apostle of Christian all-forgiving, in whom kindles the wrath of Biblical prophets, has flung his pamphlet I Cannot Keep Silent as a curse upon the heads of those who serve a hangmen and a condemnation upon those who stand by in silence. And though he refuses a sympathetic hearing to our revolutionary objectives, we know it is because history has refused him personally an understanding of her revolutionary pathways. We shall not condemn him. And we shall always value in him not alone his great genius, which shall never die so long as human art lives on, but also his unbending moral courage which did not permit him tranquilly to remain in the ranks of THEIR hypocritical church, THEIR society and THEIR State but doomed him to remain a solitary among his countless admirers. Written on Tolstoy’s Eightieth Birthday – 1908.